"Customise Your Look While Enhancing Your Energy Levels"
The Love Collection empowers the wearer with natural energy under the universal sign of enduring passion. Designed with love for the eloquent lady, this collection of Himalayan Crystal, diamonds and 18 K white and yellow gold adorns the ear, the neck and the wrist through finely designed earrings, pendants and charms. A diamond emblem of veritable love is crafted in the shape of a heart and carefully inlaid in the centre of the Himalayan Crystal. The three types of jewellery are able to improve energy and harmony of the body. The customisable Love Collection allows various wearable uses from the interchangeable collection. The Love Collection represents constant companions of symbolic love to be worn in many ways for many occasions. 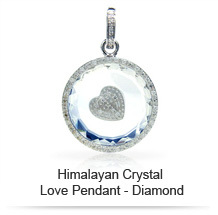 Lovingly extracted from the Earth’s embrace and then expertly crafted into the elegant Himalayan Crystal Love Pendant, the energy-infused Himalayan Crystal contains a heart-shaped diamond statement of everlasting love. Diamonds are the objects of a woman’s desire, but love is the thing she holds most dear. 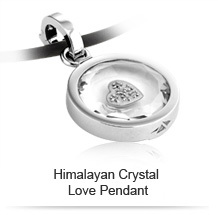 The Himalayan Crystal Love Pendant – Diamond, allows the sophisticated woman to have both. The pendant is encircled by 18 K white gold and a twinkling string of diamonds, while in the soul of the Himalayan Crystal lays the veritable sign of love, devotion, passion and admiration: a diamond-filled heart. 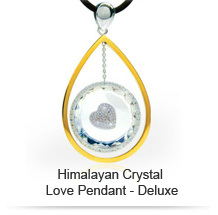 Truly one of the most delightful adornments a woman could ever wear, the radiance of the Himalayan Crystal Love Pendant – Deluxe is layer upon layer of indulgence while also possessing the natural energy of the Himalayan Crystal. Completing a tender journey from the heart of the Earth to the heart of the wearer, the Himalayan Crystal Love Pendant – Deluxe shines with the mirror-like crystal bevelled by 18k white and yellow gold and contains 29 exquisite diamonds that form a heart. 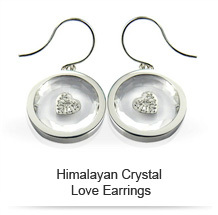 The Himalayan Crystal Love Earrings dangle with energy and drip with desire, attributed to the embedded 12-piece diamond heart that is nestled within pristine Himalayan Crystal. An 18k white gold bevel embraces the earrings set. 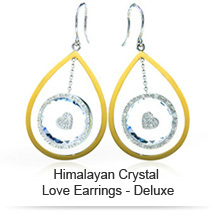 Glamourising the look of love through naturally energised Himalayan Crystal, stunning diamonds and white and yellow gold, the Himalayan Crystal Love Earrings – Deluxe are classically charming and inspiring. A total of 36 sparkling diamonds create the veritable heart in the centre of the flawless Himalayan Crystal, while the combination of white gold and yellow gold form the ideal frame for the enviable earrings.